I have been participating in the Guild of Canadian Weavers annual weaving exchange now for some years. They are quite addicting and certainly low pressure. Hostess Lynnette gives the assignment in the early spring and then have until October 1st. to turn them in, with minor postage costs. So far we have done: tea towels, card inserts, guest towels, runners and here, scarves and this year the theme is book marks. Design, weave and send in four and get four back. That's it. So here's the draft again. 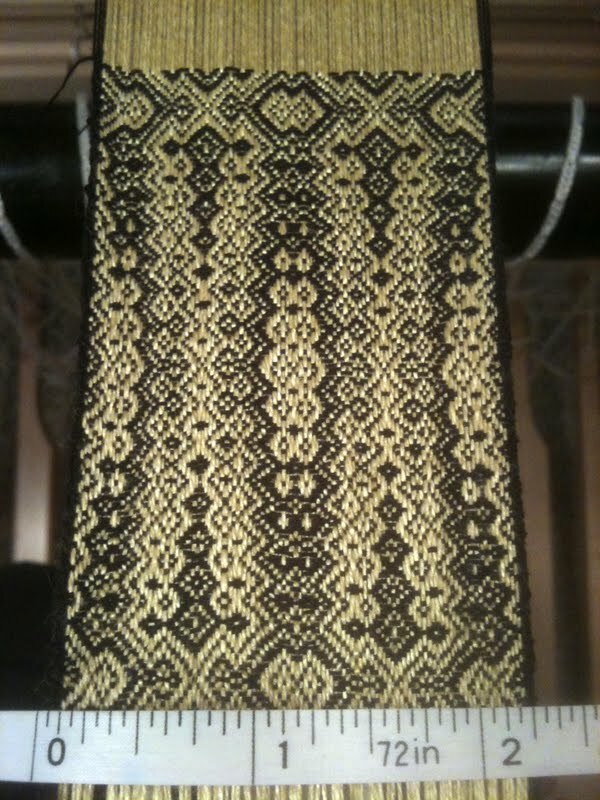 My warp is 3 yards long, sett is 47 epi and is 2 inches in the reed. 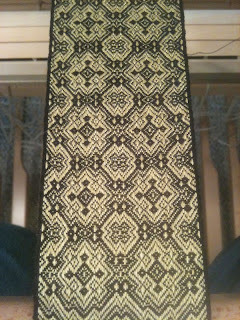 Edge threads are black 20/2 cotton and centre warp is my fine mystery linen. The linen will give a nice firm quality to the book marks. It was wound, beamed and set into the raddle all in under an hour! What a treat! Everything is quite compact and dense! This is a 20 dent reed and it's sleyed 2,2,3. So all this was done in quick time.... until we get to the tie up! That pile of ties is only half... the other pile is over to the left. I took a few days to get it done doing 3-4 treadles a day. One reason why I'm planning multiple projects from a tie up! Calli held the carpet down and kept me company. There is a perfect circle of toys around the loom! Finally I laced on to reduce loom waste and treadled the network treadling and I really like it! So tiny and compact. The pattern below is only half the bookmark and I wove another repeat, then hemstitched. 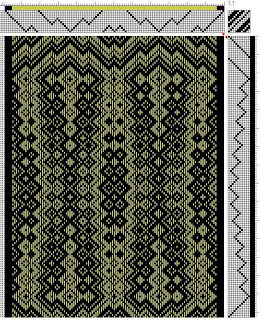 Then I wove some using the threading as my treadling (or'as drawn in' or 'tromp as writ') and I really liked this version too. During the second half of this warp, I had a linen warp thread part company. Most likely due to tension. I had a heck of a job trying to find the various ends, the heddle involved and fishing in a repair thread. It was a very tight situation and eventually it called for help from hubby and his head lamp 'cyclops' to brighten up 47 heddles crammed into one inch! We finally found it and got it squared away. It was all woven and done in no time! 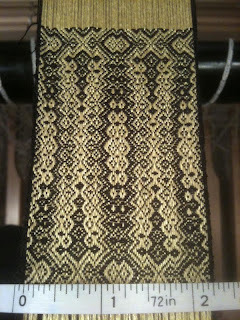 I took the warp off and gently soaked in in warm sudsy water, primarily to tighten up the pattern. I left them all linked and plan to cut apart later. Linen doesn't like having its cut warp ends washed and they can get ratty. Next, I used a rotary cutter and cutting mat for a nice clean edge. Here's a clean edge. I went on to cutting it shorter by half again as the fringe looked out of proportion. So here's the final show and tell and they are ready to go on their way later this fall! They were fun to weave up and it was a quick project. 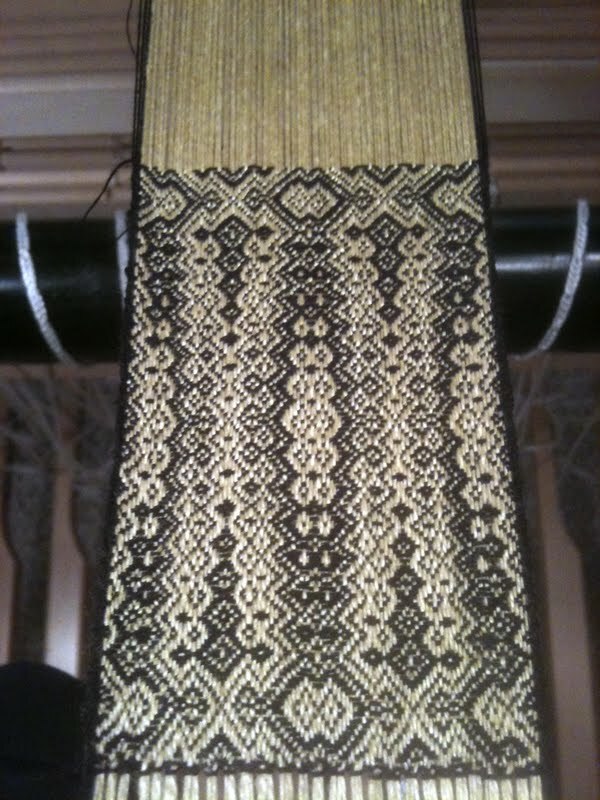 I also learned about miniature weaving and I would like to explore this in more depth at some point. Then woven as threaded, or as drawn in.... and also know as "tromp as writ" from very old drafts. Now I have a habit of resting my shuttle on the project underway and I forgot how narrow my warp was and somehow I nudged the shuttle and it lurched sideways and it fell point first onto the top of my left foot. It HURT and it developed a large goose egg lump right away and my first thought was "uh oh, that's gonna bruise"
That was an under statement! First one shows the swelling and the second the lovely evolving colours! The whole thing over the last week has turned shades of green and purple and its crept right down into my toes. 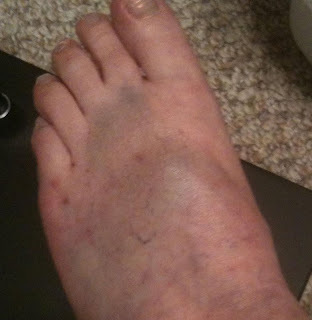 I can walk okay (for the most part) but there is still a sizeable lump where it impacted and its tender to touch. I have woven with either socks in winter and bare feet in summer and been doing this since 1995 with no mishaps. I know that some weave with shoes on or slipper style shoes but I have portions of my feet that are numb (due to my back injury) so I need to really be able to feel the skinny treadles. I think I will carry on in my usual manner but be extra careful about where I place the shuttle from now on! I have two completely naked looms! Time to get some threads moving! I left you waiting for the big reveal on the runners! I got the hand hemming done just before this past weekend and then I had to leave the wet finishing part until we got back from some days away in Vancouver. We had gone over to visit with family again and spend some time in the "Big Smoke". I guess I'm a small town girl now as I found the sheer number of cars and people rather unnerving! Its just way too busy for me and the city noise doesn't stop at any time of day or night. Sorry no pictures as I forgot my camera! Calli went into a kennel for the first time and she had great fun playing with her new inmates. She went straight from the kennel to a groomer for a bath and a haircut! I decided to hand wash the runners and used a normal washing detergent and squeezed out by hand after soaking for 15 minutes. I rolled them into towels to absorb excess water and then hung to dry over night. Orlec has such a deep shine, coupled with the mercerized cotton warp, it makes getting a decent picture of the pattern a bit tricky. I would say that the weight and hand of the all cotton runner is my favourite of the three. 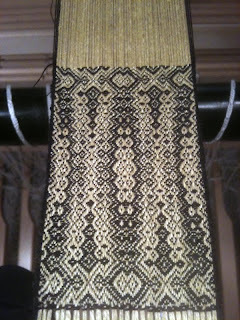 They were all woven to 50 inches or bit more, all were ladder hemstitched and are fully reversible. They all go into the box for the coming sales in the fall. More complete details on the draft and such can be found at this older post and this one as well . My little assistant is a hand twisted fencing wire gecko with glass beads. He's a flashy little fellow and originally comes from South Africa. He and his friend, a chameleon, sit on my kitchen window ledge when not modelling in photo shoots. I haven't fallen off the planet! I had a week where I nursed a twitchy low back back to something less painful. After spending three months healing from the last bad back episode, I listen when it tells me to slow down or stop! My sister came for a visit and so not much else was done during that time also. Just a whole lot of talking! Its always memorable when my sister comes to stay. :) Since she left, I have been trying to catch up on chores and life. The good news? the runners are done and off the loom. The bad news? 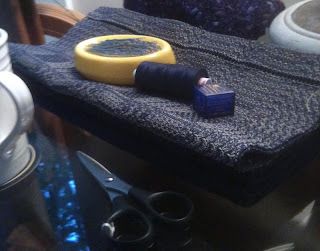 they are waiting for hand sewing the hems. I'll be starting them after I post and show them next time. I did get another warp wound and onto the Louet Spring right away. I'm participating in a weaving exchange with the Guild of Canadian Weavers and the deadline to hostess Lynnette is October 1st. I thought it might be nice to be early this year and start on them now. Its not a big deal: four book marks. That's it. Somehow I have made it a big deal! 12 shafts, 12 treadles, 47 epi with a fine linen and 20/2 cotton. Oh, and I put on three yards to make extra. 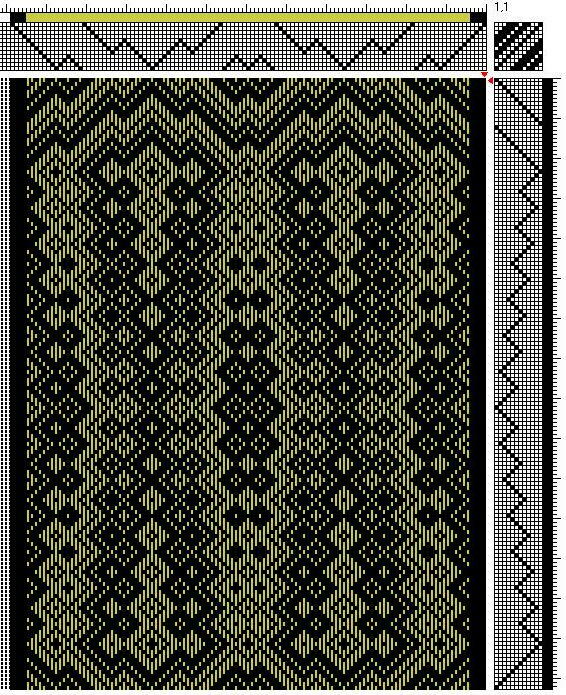 Its a point twill designed by my friend Gudrun Weisinger and is treadled "network style". No distractions while working on this one! Well, it will keep me busy for some time! I also want to do a second project off this tie up so now mulling over ideas in my head. So there should be some show and tell in the next post for you. Hope your summer is going well! PS We took our house off the market and staying put for now. 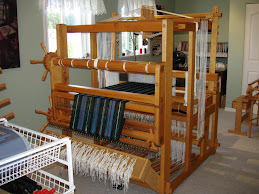 That means I can plan a warp for my big loom now that it won't be dismantled. Life is getting back to normal.